A Palestinian youth hurls stones at Israeli soldiers during clashes in the West Bank refugee camp of Qalandia on Thursday. 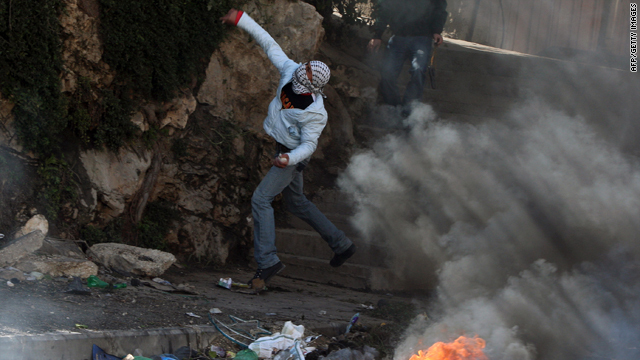 Tensions over an Israeli announcement of new settlement plans have helped spark the worst riots in years. Washington (CNN) -- The U.S. special envoy for Middle East peace is returning to the region this weekend as the United States continues its discussions with Israel over the Obama administration's demand that the country reverse its decision on construction in disputed territory in East Jerusalem. Israeli Prime Minister Benjamin Netanyahu has spoken with U.S. Secretary of State Hillary Clinton, and they have discussed specific actions that might be taken to improve the atmosphere for progress toward peace, said State Department spokesman P.J. Crowley on Thursday. "We are going to review (Netanyahu's) response and continue with both sides to keep ... talks moving forward," he said, adding that U.S. Mideast envoy George Mitchell would meet this weekend with Netanhyahu and Palestinian Authority President Mahmoud Abbas. According to the prime minister's office, Clinton and Netanyahu spoke Thursday evening, and Mitchell is expected in Israel on Sunday. In his conversation with Clinton, Netanyahu suggested "mutual confidence-building measures" between Israel and the Palestinian Authority in the West Bank, a statement from his office said. Netanyahu's response has been unanimously backed and approved by the seven ministers of Israel's inner cabinet. Officials in Washington and Jerusalem said Netanyahu would be in Washington on Monday for the American Israel Public Affairs Committee conference. An Israeli official said the gestures the Israelis could take include easing some roadblocks and releasing some Palestinian prisoners -- measures Israel said it was prepared to take before the announcement of the East Jerusalem settlement project. Israel came under fire last week when it announced during U.S. Vice President Joe Biden's visit to Israel the planned construction of 1,600 new housing units in a disputed area of Jerusalem claimed by both Israelis and Palestinians. Addressing the Knesset on Monday, Netanyahu said, "In the last 42 years there has not been a government that has limited the building in Jerusalem." Two days later, Israeli Foreign Minister Avigdor Lieberman made a stronger statement on settlements, saying the pressure on Israel to refrain from building housing in East Jerusalem is "not reasonable." Meanwhile, Clinton arrived in Russia on Thursday to jump-start talks on two diplomatic fronts: a new nuclear treaty between the countries and the stalled Mideast peace process. On Friday, Clinton will represent the United States in a meeting with other members of the Mideast Quartet -- the United Nations, the European Union and Russia. The group has been working to negotiate a peace deal between Israel and the Palestinian government. But Israel's announcement last week of plans to build the housing units in disputed East Jerusalem drew a rebuke from the United States. The Obama administration has asked Israel to rescind the decision, to show its commitment to the peace process, a U.S. official and an Israeli official told CNN on Monday. Two days before Israel announced the construction, Mitchell said Israel and the Palestinians had agreed to indirect peace talks mediated by him. Mitchell also asked both sides not to do anything provocative that would jeopardize those talks. Clinton earlier this week dismissed any notion that relations between the United States and Israel are in crisis after the row between the two countries over settlements. "Oh, I don't buy that," Clinton told reporters Tuesday at the State Department. "We have an absolute commitment to Israel's security. We have a close, unshakable bond between the United States and Israel and between the American and Israeli people." An Israeli official earlier confirmed that Israel's ambassador to the United States, Michael Oren, had told fellow Israeli diplomats that relations between the two countries are "in a crisis." Clinton acknowledged the United States expressed its "dismay and disappointment" after Israel's announcement on the settlement. She said U.S. and Israeli officials are in intense talks "over steps that we think would demonstrate the requisite commitment to this process," and the United States is waiting for a response from Israel on steps it is willing to take. She did not say when or how that response would be conveyed.